Better Materials. Better Workmanship. Better Awnings. What sets Belle Isle Awning apart from the competition? It’s Simple: An uncompromising commitment to quality in everything we do, including design, manufacture, installation, repair, and customer service. For more than 80 years, quality has been our calling card, and our reputation for an outstanding product and outstanding service has led us to being our industry’s word-of-mouth leader as satisfied customers spread the word to their families and friends. You may think all awnings are alike. In many cases, you’d be right. Plenty of companies are happy to sell you prefabricated products at inflated prices: Awnings that look the same from one installation to the next, assembled from low-quality, mass-manufactured tubes, fittings, and fabric. Cheaper awnings may look great at first glance, but a season’s wear and tear or some bad weather might change that quite quickly. Broken bindings, faded colors, bent frames or unsightly tears can quickly turn a cheap prefab awning into an expensive, irreparable eyesore. That has never been good enough for us, and it should not be good enough for you. 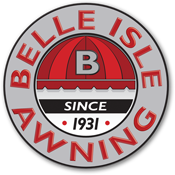 It’s not just what we do that sets Belle Isle Awning apart from our competitors – it’s what we don’t do. We don’t create cookie-cutter designs. We don’t use cheap, failure prone materials. We don’t skimp on training or quality control. And we don’t sell a substandard product – period. Experience. Every installation crew’s team leader has more than 20 years with the company, and our average technician has been with us for 18 years or more. Materials. We use the best – period. Heavy-gauge tubing, durable fabrics, corrosion-resistant clasps and fittings, and time-honored manufacturing and installation techniques mean longer-lasting, better-looking awnings. Design. Each awning we install is custom designed and fabricated specifically for your home or business. It will fit perfectly and look great. Service. If you have a problem, you won’t find yourself speaking to an operator – you’ll be talking to the owner. Company President Blair Belluomo stands behind every awning we sell. He’ll see to it that your job is done right and you’re fully satisfied.